We’d love your help. Let us know what’s wrong with this preview of The Sledge Patrol by David Howarth. To ask other readers questions about The Sledge Patrol, please sign up. I have to hand it to David Howarth; he really knows how to find and tell a good ‘story’. “The Sledge Patrol” is an eye-opening narrative of what must rank as one of the, if not the, most extraordinary conflicts of World War 2. The action takes place in Greenland (a colony of Denmark), the largest island in the world, possessing 1600 miles of coastline, and with (in 1940) a population of just 22,000 souls, predominantly living on the West coast. North of Scoresby Sound on the East coast the human I have to hand it to David Howarth; he really knows how to find and tell a good ‘story’. “The Sledge Patrol” is an eye-opening narrative of what must rank as one of the, if not the, most extraordinary conflicts of World War 2. The action takes place in Greenland (a colony of Denmark), the largest island in the world, possessing 1600 miles of coastline, and with (in 1940) a population of just 22,000 souls, predominantly living on the West coast. North of Scoresby Sound on the East coast the human population comprised a total of 26 men and one woman. Twelve of those men survived by hunting; each in their own territories of approximately sixty miles square. The remaining fourteen men were there to man four weather stations; one Danish, three Norwegian. After the invasion of Denmark in 1940, the Germans became extremely interested in the reported weather observations by stations on Greenland; which were transmitted in unencrypted international code (it had not occurred to the British to supply encryption, and Occupied Denmark was naturally unable to do so). Weather observations in Greenland were key to accurate forecasting of the weather in the North Atlantic ocean; on which the outcome of the Battle of the Atlantic was to depend. “The Sledge Patrol” is the engrossing story of the preparations against a possible German invasion of North-East Greenland (70° to 75°30’ N), and what happened when that unexpected event occurred. Here is a truly remarkable description of the transposition of the concept of mass warfare to a highly hostile and very scarcely populated land where everyday personal survival against the brutal beauty of the elements had long since bred an unquestioning social and spiritual morality of generosity and complete unselfishness. Crime in the under-populated Arctic was unknown: the concept of war and ‘enemy’ was barely graspable to a human mind operating in such spiritually majestic surroundings. This is precisely why Howath’s narrative in this book is so very interesting. Those different ‘rules,’ knowledge, and survival skills which applied in the winter Arctic wastes of Greenland, gave rise to a unique approach to battle. "The Sledge Patrol" is a book I read in order to while away the time on a recent long-haul flight, and it turned out to be a remarkable true-life adventure from WWII, a sideshow in the grand scheme of a conflict in which more than 50 million died, but a human drama to match any. The book relates the story of the 15 or so men of the North-East Greenland Sledge Patrol, a mixture of Danish, Norwegian and Inuit civilians appointed by the Wartime Danish Governor of Greenland to patrol a remote and alm "The Sledge Patrol" is a book I read in order to while away the time on a recent long-haul flight, and it turned out to be a remarkable true-life adventure from WWII, a sideshow in the grand scheme of a conflict in which more than 50 million died, but a human drama to match any. The book relates the story of the 15 or so men of the North-East Greenland Sledge Patrol, a mixture of Danish, Norwegian and Inuit civilians appointed by the Wartime Danish Governor of Greenland to patrol a remote and almost uninhabited 500-mile stretch of coastline to check for signs of German infiltration. The author explains that whilst the men involved undertook their duties conscientiously, most were initially bemused at the idea the German Army might invade NE Greenland. They were though happy to take a salary from the Government for doing something they would have done for nothing, i.e. travelling up and down the coast by dog sledge; and hunting. To give the men legal status and the (theoretical at least) protection of the Geneva Convention, the Danish Governor even officially designated them "The Greenland Army", something which he himself saw the comic side of. However things got serious in the spring of 1943, when three members of the scattered Sledge Patrol did actually discover Germans in Greenland. This was a party of 19, mainly meteorologists sending weather reports that were valuable to the German U-boat operations in the North Atlantic. This discovery, and the fact the Germans knew they had been discovered, led to clashes between the two sides and a desperate retreat by the Danes, who were armed only with hunting rifles and faced opponents with machine guns and grenades. The subsequent story includes several tales of astonishing human endurance, and for the reader the tension is maintained by the knowledge that this is a true life story and therefore not necessarily subject to a Hollywood-style happy ending. The east coast of Greenland is a vast wasteland inhabited only by a few intrepid hunters. Technically a Danish colony, some 2200 miles away and geographically part of North America, the Greenland governor decided to cast the island’s lot with the allies, after Denmark was overrun by the Germans. It was of strategic importance to the United States and Britain who needed weather reports in order to predict weather over Europe. I didn’t realize just how far north the country is until I looked at a The east coast of Greenland is a vast wasteland inhabited only by a few intrepid hunters. Technically a Danish colony, some 2200 miles away and geographically part of North America, the Greenland governor decided to cast the island’s lot with the allies, after Denmark was overrun by the Germans. It was of strategic importance to the United States and Britain who needed weather reports in order to predict weather over Europe. I didn’t realize just how far north the country is until I looked at a globe. It’s a forbidding country, uninhabited by only a few natives, and with severe weather. A small group of Arctic-loving Norwegians and Danes protected the vital radio and weather equipment under very difficult circumstances. Ironically, the German captain sent to invade and seize the station was an Arctic climate lover himself and was sympathetic to those who lived and worked there. One cannot help but admire the hardiness of these folks who thought nothing of walking, often with hardly any supplies but a rifle to ward off polar bears, hundreds of miles in horrible conditions, thinking nothing of it. The culture of these Arctic lovers and Eskimos was the antithesis of what was going on in the rest of the world. To survive they needed to be able to help each other and to count on that assistance. The prospect of shooting someone else or anything not for food was completely foreign to the Eskimos, especially, who had no comprehension of why the fighting was going on hundreds of miles away. The entire Greenland “army” consisted of nine (!) men tasked with patrolling an immense coastline. That they ever ran into anyone else is simply astonishing. David Howarth has done a service of showing us how WW II was truly a *world* war and how it affected even desolate parts or the globe. Fascinating. I suspect some of it was fictionalized as the internal monologues and thinking of some of the participants must have been impossible to document. Very interesting episode illuminating a small corner of WWII. If you're into "man against the elements" stories, this book details events about people pushing the envelope of survival in one of the most inhospitable environments on the planet. The book also is one of the few that genuinely shows the dichotomy of ideologies in the German military and does it more convincingly than the bulk of revisionist history and fiction. Reality again trumps fiction. Amazing story of how a small band of Danes and Greenlanders fought an equally small band of Germans on the North-East coast of Greenland during the spring and summer of 1943. Amazing feats of human endurance and a shrewd insight into the psychology of the protagonists. Highly recommended. Interesting book. I did not know that Greenland was involved in World War II. I felt really bad for the lost of so many sled dogs. Entertaining and interesting, to think that there was a battle in such a country as Greenland. There were multiple typos through the book but I'm fine with that. Though I didn't like that the book tried really hard to tell us who were the good guys, they didn't stop with the Ritter is actually good thing through the whole freaking book, that was pretty annoying. An interesting account of the patrolling of Northeast Greenland during WW II for Germans. I was drawn to the book because of my Danish ancestors. Greenland is controlled by Denmark and there were a number of Danes in the Sledge Patrol. Whereas I found it an interesting read concerning living in the Arctic, I was put off by numerous typos. Poorly edited! It took a little bit to get going but was a very interesting book. It's the Danes vs the Germans in Eastern Greenland during WWII. A number of weather station outposts had been established by the Danes providing weather reports to the British and American forces. When the signals started being coded so the Germans couldn't get them as well, a German group landed and set up their own weather station. For a while, the German presence was hidden, but all that changed when one of the Danish group was on patrol and came across footprints. From that point on, it bec It's the Danes vs the Germans in Eastern Greenland during WWII. A number of weather station outposts had been established by the Danes providing weather reports to the British and American forces. When the signals started being coded so the Germans couldn't get them as well, a German group landed and set up their own weather station. For a while, the German presence was hidden, but all that changed when one of the Danish group was on patrol and came across footprints. From that point on, it became a battle for survival on each side. A pleasant surprise. I sometimes read a book at random based on the synopsis on the back cover. This ended up being a very interesting account of a little known incident in WWII Greenland, when a handful of Danes and a few dozen Eskimos armed with nothing but their cold weather survival knowledge and a few hunting rifles, found themselves defending Greenland against a landing party of machine-gun wielding German Nazis. A good polar adventure and human drama. 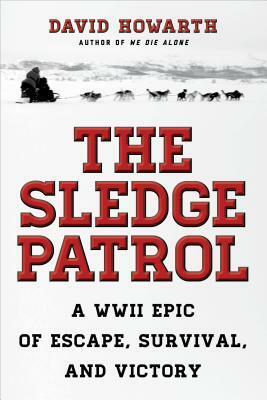 Great book about the little known history of the Sledge Patrol in Greenland. A book about adventure, endurance and survival which is well written and gripping. Loved this book and recommend it to anyone who likes to read about Arctic adventures. A lot of background is given about the history of Greenland so there is a fascinating history lesson here as well. How men who patrolled a 500 mile stretch of Greenland by dogsled fought capture or death by outwitting and outlasting the Nazis. Great book. Riveting. Couldn't put it down. I've recommended it to a number of friends.